Western blot analysis of extracts from 293 and RD cells using 4EHP (D54C2) Rabbit mAb. 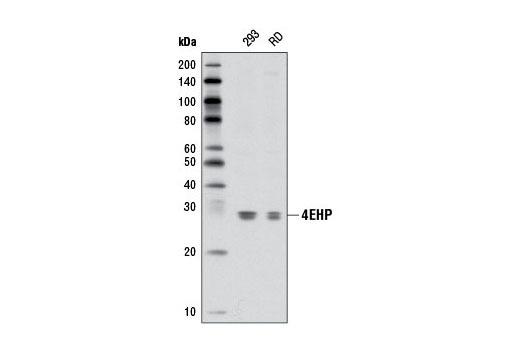 4EHP (D54C2) Rabbit mAb recognizes endogenous levels of total 4EHP protein. Monoclonal antibody is produced by immunizing animals with a synthetic peptide corresponding to residues near the amino terminus of human 4EHP protein. A mammalian cap-binding protein related to eIF4E, 4E Homologous Protein (4EHP), was later identified (6). 4EHP does not interact with eIF4G and therefore cannot activate translation (7). Instead, it inhibits the translation of a subset of mRNAs (7). Rom, E. et al. (1998) J Biol Chem 273, 13104-9. Zuberek, J. et al. (2007) RNA 13, 691-7.